(11339.2, Industrial Development and Parks Commission Collection, OHS). Situated in the southwestern corner of Alfalfa County on State Highway 45, two miles west of State Highway 8, Carmen lies within the part of Woods County that became Alfalfa County in 1907. This wheat-farming area opened as the Cherokee Outlet in September 1893. One and one-half miles west of present Carmen, Augusta had emerged in the wheat country circa 1895. When the Kansas City, Mexico and Orient Railway (later the Atchison, Topeka and Santa Fe Railway) planned a line through the county, its Mutual Townsite Company laid out New Augusta (present Carmen) and sold lots in December 1900. It rapidly developed in anticipation of rail access. Many of Augusta's businesses immediately moved there. The towns coexisted for several years. On August 3, 1901, the Choctaw Northern Railroad (later the Chicago, Rock Island and Pacific), line reached "Old" Augusta, and the railroad's townsite company tried, unsuccessfully, to lure the businesses back. At its 1901 incorporation New Augusta was renamed Carmen (reportedly by an Orient railroad director to honor the wife of Mexico's president, Porfirio Díaz), receiving that postal designation in September, with William B. Parker as postmaster. The Orient reached Carmen on March 20, 1903. Although "Old" Augusta kept its Choctaw depot and elevators, it withered away. Carmen's progress stopped temporarily on the evening of May 23, 1903, when a tornado destroyed the fledgling town of wood-frame buildings, killed three people, and injured 150. However, the resilient residents soon built brick buildings and churches and three grain elevators. In early 1904 the Arkansas Valley and Western Railway (part of the St. Louis and San Francisco Railway system) completed a line from Enid through Carmen to Avard, helping resurrect the town. After incorporating in 1905, at 1907 statehood it vied for selection as county seat but lost to Cherokee. By that time Carmen was an important wheat-shipping and agribusiness center. Unlike "Old" Augusta, Carmen flourished. By 1909 a flour mill, a creamery, three elevators, a bottling works, and an ice plant operated. By the mid-1930s the community supported six churches, a fourth grain elevator, three hotels, six groceries, a movie theater, and three dozen other retail establishments. The Woods County News, the Alfalfa County News, the Carmen Sunlight, and the Carmen Headlight printed the news. Educational facilities included a public high school in a $100,000 building. 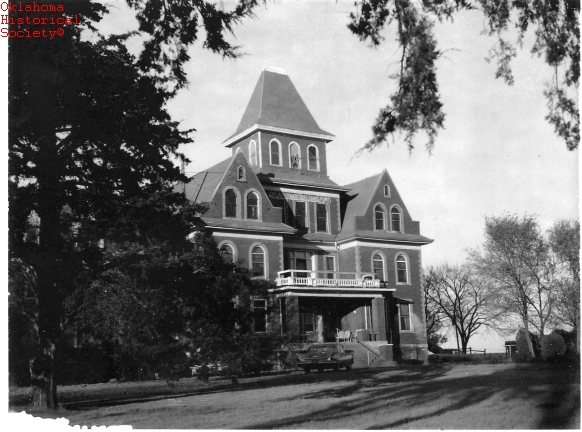 In 1906–07 the Independent Order of Odd Fellows (IOOF) constructed an orphan's home one mile north of town. Citizens donated a quarter section of land for the $25,000 building, which served more than a thousand youths before closing in 1944. It is listed in the National Register of Historic Places (NR 84002944), as is the IOOF Lodge Number 84 (NR 84002948). The multiple railroads anchored Carmen's future as a shipping and marketing point for grain, livestock, dairy products, and poultry. During Carmen's first five decades its population hovered between seven hundred and nine hundred, peaking in 1930 at 904. The 1940 census recorded 818, and the 1960, 533. The Rock Island ceased service in 1958, and by 2000 only the Burlington Northern Santa Fe Railway remained. The Santa Fe became the Texas and Oklahoma Railroad in the 1990s. Declining rural population caused Carmen and Dacoma citizens to consolidate their public schools in 1968. At that time the enrollment stood at 250 students. During the 1940s and 1950s agribusinesses included a Farmers' Union Co-Op Exchange, three implement dealers, and two dozen retail stores. The census counted 516 inhabitants in 1980 and 459 in 1990. In the 1990s a fund-raising project helped construct a granite war memorial in a city park to honor local war veterans. In 2000 more than a third of Carmen's employed residents commuted to work in other towns, at a time when the population stood at 411. The 2010 census recorded 355. "Carmen," Vertical File, Public Library of Enid and Garfield County, Enid, Oklahoma. "Carmen," Vertical File, Research Division, Oklahoma Historical Society, Oklahoma City. Our Alfalfa County Heritage, 1893–1976 (N.p. : Alfalfa County Historical Society, 1976). Profiles of America, Vol. 2 (2d ed. ; Millerton, N.Y.: Grey House Publications, 2003). Woods County News (Augusta/Carmen, Oklahoma Territory), 16 August 1901 and 6 September 1901. Dianna Everett, "Carmen," The Encyclopedia of Oklahoma History and Culture, https://www.okhistory.org/publications/enc/entry.php?entry=CA056.